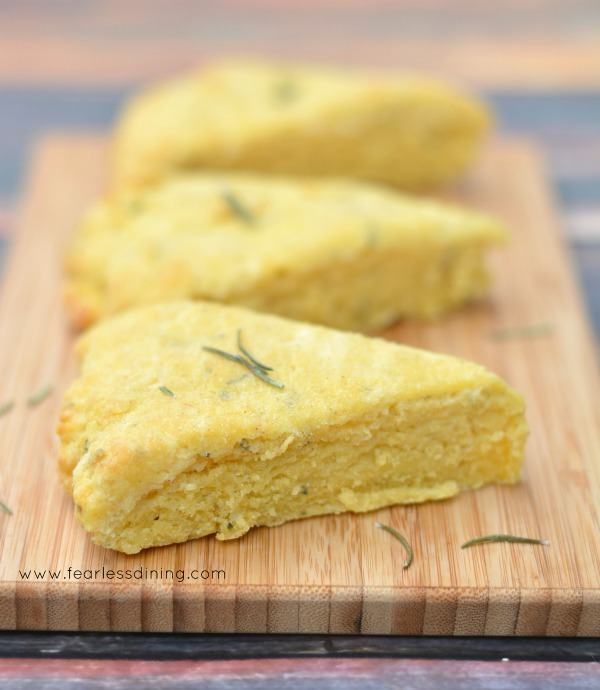 Savory Gluten Free Cheese Scones are a great addition to any meal. Flavored with a sweetness of cornmeal then mild Fontina Cheese and Fresh Herbs, these savory scones are perfect with any meal. You will love the step by step directions to make the perfect savory scones, every time! 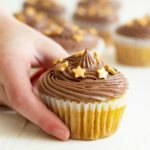 I have been baking a lot of gluten free sweets the past few weeks. Blame my sweet tooth, or blame anyone except Mr. Fearless Dining :-). He is over all of the sweets I have been baking lately. I will NEVER be over sweets, I have a crazy sweet tooth, but it is time to make something savory for a change. 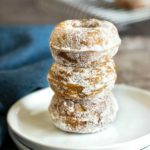 I always love to have gluten free bread or a gluten free roll with dinner, but gluten free rolls are often a challenge to make. I have had a lot of yeast and rising fails! Luckily, I am a scone baking expert! The first step to making these gluten free cheese scones is to add your dry ingredients to a large bowl. Add very cold butter chunks. 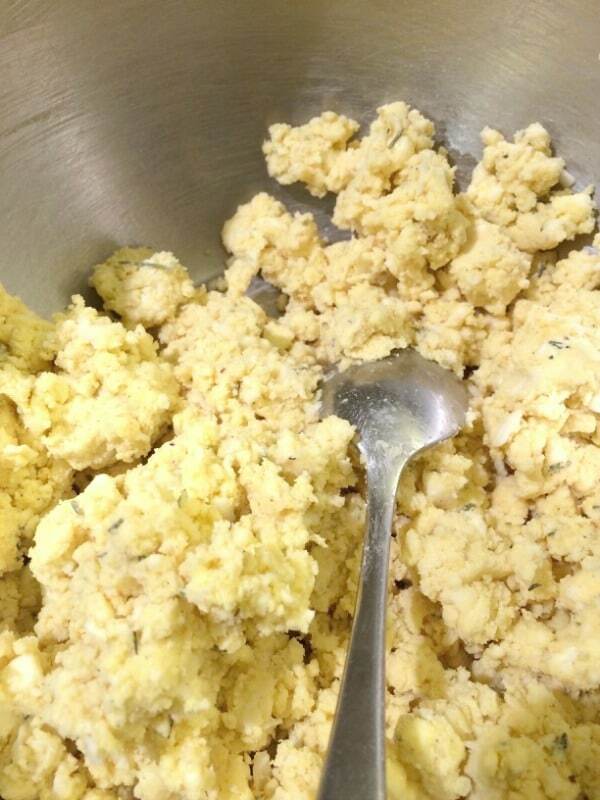 Use a pastry blender to cut the butter into the dough. 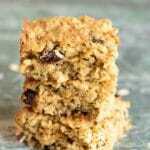 You will want your scone mixture to be grainy when you are finished. Next, in a medium bowl, add your wet ingredient and whisk to blend. Pour the wet ingredients over the dry ingredients. Shape the raw dough on a piece of parchment paper. 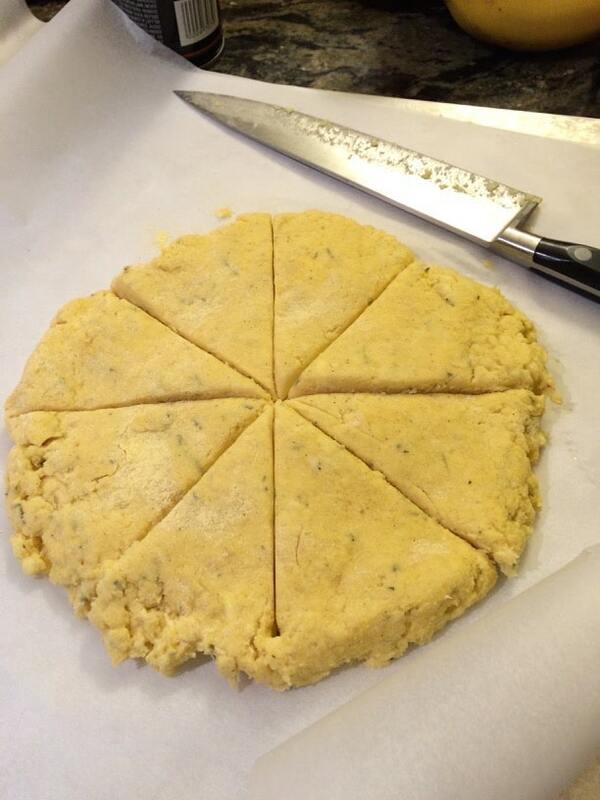 Press to 1″ thickness and then cut the raw dough into sections. Use a knife to cut the dough into 8 wedges as pictured above. This will make your cut lines so much easier to re-cut when the scones are baked! Then, just lift the parchment paper and place it onto a large baking sheet. You can bake it directly on the parchment paper. Do you have to shape the scone dough into a circle? You can make your scones any shape you like. You can even use a cookie scoop to make your scones drop biscuit style. Other people may want smaller scones. 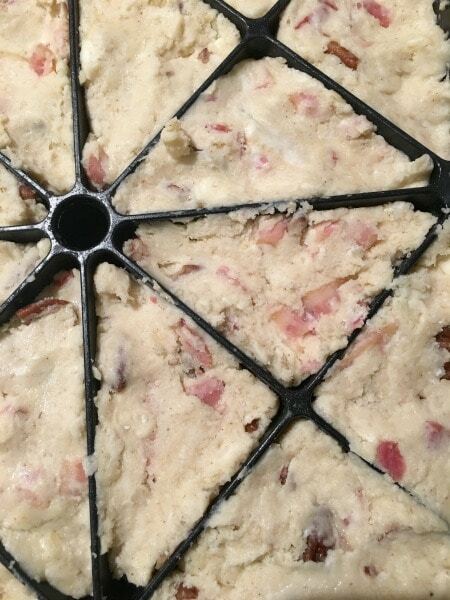 You can also use a scone pan like the one pictured below with maple bacon scone dough. This gives you smaller scones that are perfect for entertaining. See the little sections? You can fill each scone section with the scone batter. Can’t you just imagine a bread basket with cute little scones? If you can’t have corn flour, substitute with gluten free flour blend. Instead of using cornmeal, sorghum, and tapioca individually, just use 1 1/2 cups + 2 tablespoons of the gluten free flour blend. 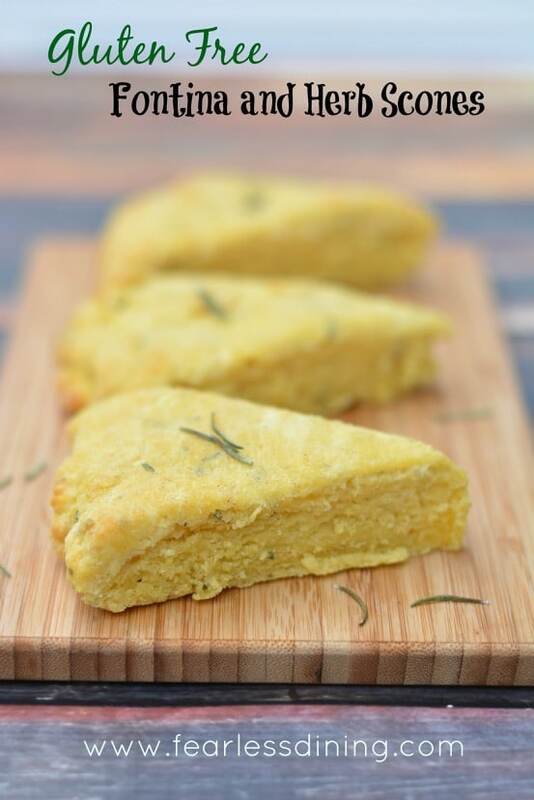 Can I use a different kind of cheese in this gluten free savory scone recipe? 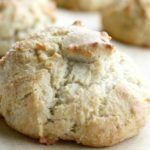 Can I use different herbs in this scone recipe? You can definitely use different herbs in this recipe. Consider this gluten free savory scone recipe a base that you can customize. If you choose to use mozzarella for the cheese, use fresh basil instead for a more Italian scone. The small scone pan I mention is perfect to bake scones on! 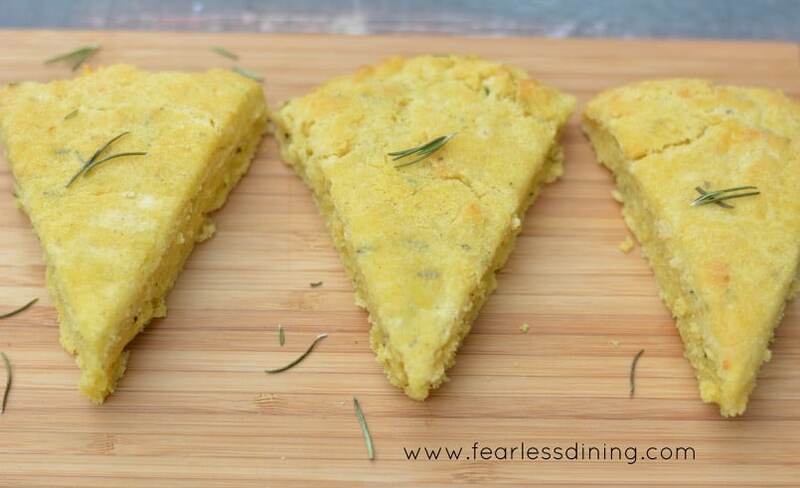 This cornmeal is certified gluten free and delicious in this recipe. Cut your butter into the flour with a pastry blender. 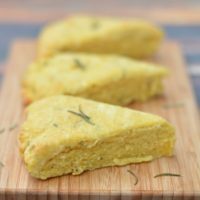 Savory gluten free fontina and herb scones are delicious to serve with any meal, or even a hot bowl of soup. 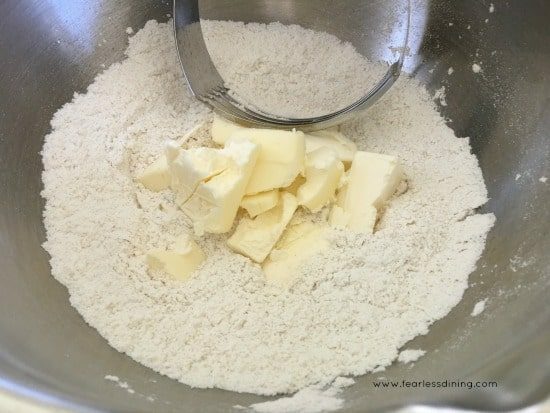 Add cold butter and cut into flour with pastry blender. In a small bowl add milk, egg yolks, and spices. Pour into dry ingredients and mix. Put dough in middle and press into a circle shape about 1 inch thick. Cut sections in the raw dough. More Yummy Scone Recipes to Try! This looks scrumptious! I’m not gluten intolerant but I like to cook gluten free recipes every now and then to give my stomach a break. I can’t wait to try these scones! I really like this savory take on a scone. I have only ever had sweet scones. And the fact that these have my ultimate favorite cheese in them makes it all that much better for me. These are wonderful, fontina is such a underused cheese in my opinion. Perfect for a brunch. I love fontina as well. This is a great scone recipe. When I was growing up, we would have scones on Saturday or Sunday Afternoons. I would love to make these recipe. Thank you Rini. I also love scones and remember all of the scones I enjoyed when I was eating gluten. Such a nice job with these scones; beautifully done once again! Hi Christine, I would say they are more scone like and dense compared to corn bread. Those look absolutely fabulous, Sandi! But FYI, I don’t see fontina listed in the ingredients or the instructions. You’re welcome, Sandi! I’m pretty sure that’s like me going to the grocery store with a short list and coming back WITHOUT the main thing on the list. 😉 It happens all too often! it says 1/4 tapioca starch. 1/4 what? Cup? You are correct Kim, it is a 1/4 cup. I will clarify in the recipe. Thank you so much for emailing and pointing it out.